Easter is such a fun time of year! The weather is warming up, flowers are blooming, and fun Easter traditions are in motion. It’s an exciting time when the weather is beautiful! I always look for new, fun, and unique traditions to do with my kids around holidays, and I’m excited when I find traditions that are easy for me AND fun for the kids! There is nothing like seeing your children’s eyes light up, while still having the energy to enjoy participating with them. It’s hard when you want to take your kids out for a fun Easter extravaganza or Easter egg hunt, and you feel bombarded by all the people and kids running around. 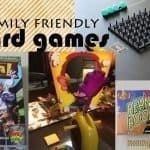 These activities are fun to do with just your children or to invite friends over to participate as well! 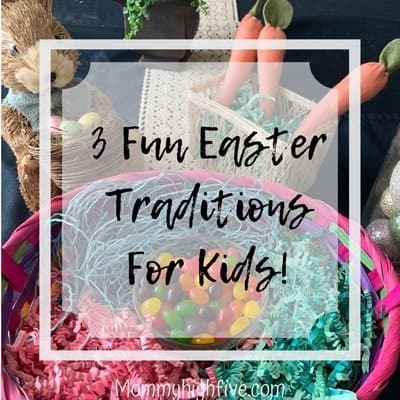 In this post, I share 3 fun traditions I do with my kids that they look forward to every year! These activities are tried and true activities to leave your kids smiling and excited for this special time of year! And the great thing is they correlate with each other. You can get a handful of items and use them for more than 1 activity, making them more worth your money. Win/win! My kids love eating jelly beans! So what’s more fun than to have a taste test on all the different flavors? We love to get the Starburst brand of jelly beans because they taste great and are gluten free. I put some in a little bowl and grab a handkerchief so they can’t see the color. 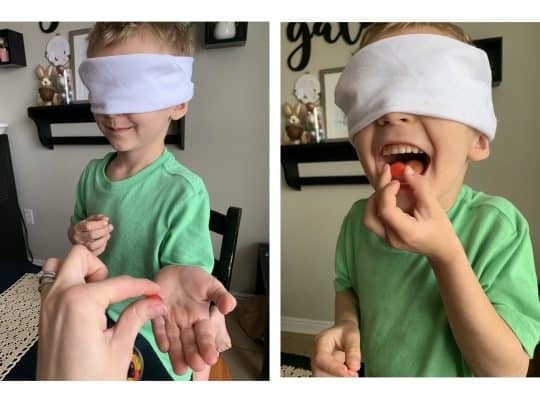 They laugh and have so much fun guessing what color and flavor they are eating! And they really don’t care if they get it wrong because they get to eat jelly beans. We usually get the Original flavor, but it would be fun to try with the tropical jelly beans, too! I put some in a little bowl and grab a handkerchief so they can’t see the color. They get to try one at a time, and give a guess, as we take turns. It is even a little tricky for me to guess the flavors sometimes! This is a fun tradition we save for the night before Easter. It’s a great activity for the kids to learn more about planting something with love and seeing it bloom the next day. 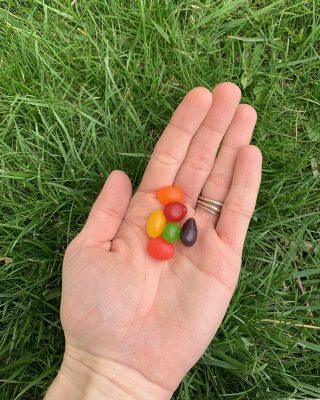 The kids grab a few jelly beans each and we go out to a certain spot in our yard and they plant the jelly beans. 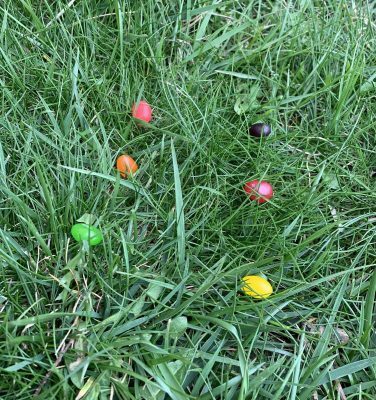 They can leave the jelly beans on top of the grass, or use their finger to push them down a little into the dirt. The important ingredient is for the children to give love to the little beans. Then, only on Easter morning, the jelly beans grow into lollipops! I love to use the lollipops with gum in the middle. They resemble the jelly beans and are nice and big! This is one tradition we started a few years ago, and my daughter still reminds me of it. 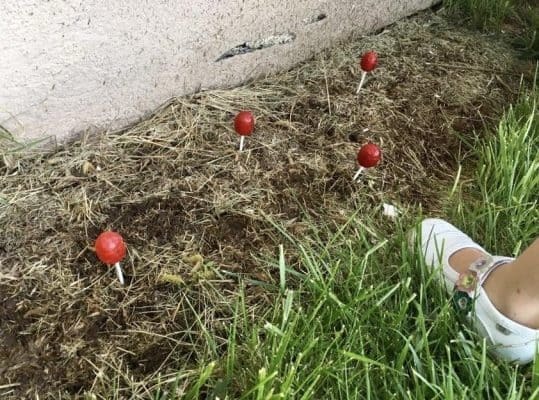 It’s so fun to see their amazement Easter morning when beautiful lollipops are sticking out of the ground! 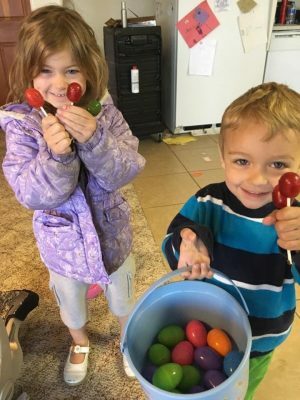 The key is to ditch the jelly beans they plant and save the wrappers for the lollipops so you have something to wrap them in after the kids bring them inside. Or have a special thing to wrap them in if you want to save them. My kids love Easter egg hunts. They actually try to do Easter egg hunts all year round and put little snacks inside. 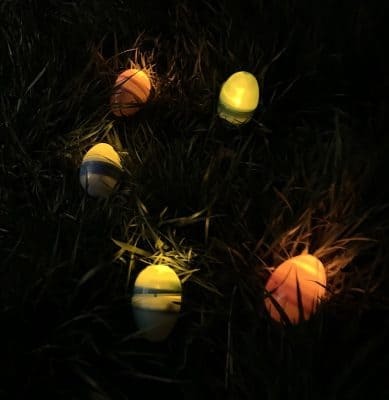 So having a glow-in-the-dark Easter egg hunt makes for a fun and unique time for the kids! We put tea-lights in the bigger Easter eggs, and they fit great! It was hard to try and make glow sticks fit into the Easter eggs, so instead, we let the kids wear the glow sticks. They loved wearing glow-in-the-dark gear while hunting for Easter eggs in the dark. This is a fun one to do inside also! 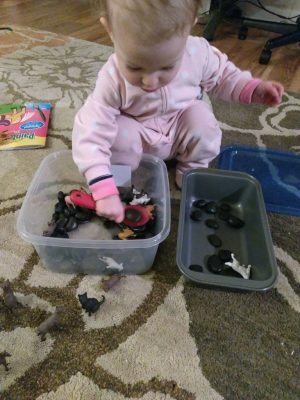 No matter how the weather turns out, you can utilize this fun activity inside. 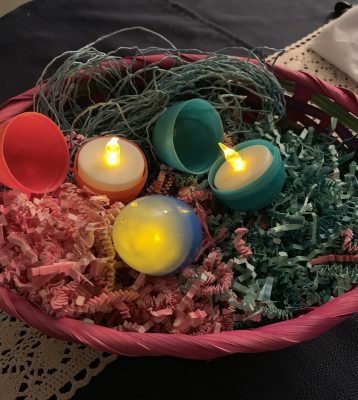 Since we couldn’t add candy to the eggs with tea-light candles inside, we had a little prize bucket so they could pick a prize. After they gathered their glow-in-the-dark eggs, they counted them and could pick a special prize. This activity helped minimize the amount of candy they had around Easter and was so fun! Another pro to this activity is the kids found all the Easter eggs! It was hard to walk by them when they were glowing. Traditions make my heart so happy! I remember fondly the traditions I had at Easter time as a child and always looked forward to them! 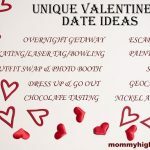 Now that I am a mom, it’s so convenient to have easy traditions that I love just as much as my kids do! Leave the stress behind and simplify with these 3 easy activities. They are fun and will for sure leave your children with memories they will remember and continue to use with their families! These traditions are also great for any age group. I would have been thrilled to have a glow-in-the-dark Easter egg hunt as a tween or teen! Do you have a list of fun activities you like to do around this time of year? Sometimes it’s hard to fit everything in! Keep it simple, and don’t worry about over scheduling your days at this fun time of year! Have a wonderful Easter and let us know your favorite Easter tradition below, and if you choose one of these!